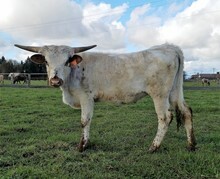 Great young cow that we have been very happy with. Tons of horn, great disposition and a perfect body type. She has thrown us two great heifers (one over 60"ttt at 2 years). 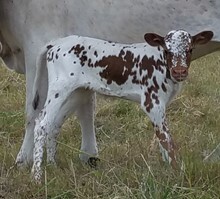 We have her confirmed bred to RJF Frostbite. Consigned to the 2019 Spotlight Sale. Tip to Tip 68.8750 10/21/2018 Splintered tips.